This article is about the atoll. For the band, see Enewetak (band). 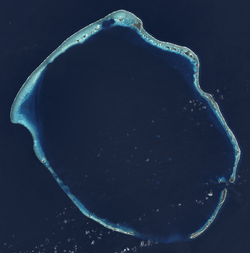 Landsat 8 satellite image of Enewetak Atoll. The crater formed by the Ivy Mike nuclear test can be seen near the north cape of the atoll, with the smaller Castle Nectar crater adjoining it. 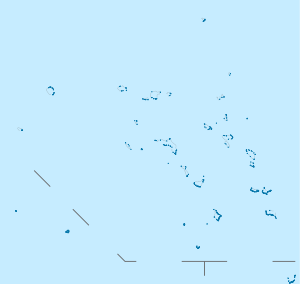 Enewetak Atoll (or Eniwetok Atoll, sometimes also spelled Eniewetok; Marshallese: Ānewetak, [æ̯ænʲee̯ɔ̯ɔ͡ɛɛ̯dˠɑk], or Āne-wātak, [æ̯ænʲee̯-ɒ̯ɒ͡ææ̯dˠɑk]) is a large coral atoll of 40 islands in the Pacific Ocean and with its 850 people forms a legislative district of the Ralik Chain of the Marshall Islands. With a land area total less than 5.85 square kilometres (2.26 sq mi), it's not higher than 5 metres and surrounds a deep central lagoon, 80 kilometres (50 mi) in circumference. It is the second-westernmost atoll of the Ralik Chain and is 305 kilometres (190 mi) west from Bikini Atoll. 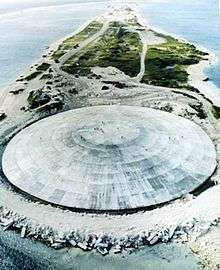 Nuclear testing by the US totaling more than 30 megaton TNT took place during the cold war; in 1977–1980, a concrete dome (the Runit Dome) was built on Runit Island to deposit radioactive soil and debris. The Runit Dome is deteriorating and could be breached by a typhoon, though the sediments in the lagoon are even more radioactive than those which are contained. 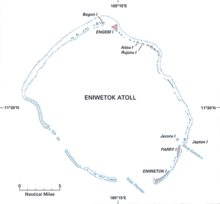 The U.S. government referred to the atoll as "Eniwetok" until 1974, when it changed its official spelling to "Enewetak" (along with many other Marshall Islands place names, to more properly reflect their pronunciation by the Marshall Islanders). Enewetak has a mean elevation above sea level of 10 feet (3.0 m). Humans have inhabited the atoll since about 1,000 B.C. The first European visitor to Enewetak, Spanish explorer Alvaro de Saavedra, arrived on 10 October 1529. He called the island "Los Jardines" (The Gardens). In 1794 sailors aboard the British merchant sloop Walpole called the islands "Brown's Range" (thus the Japanese name "Brown Atoll"). It was visited by about a dozen ships before the establishment of the German colony of the Marshall Islands in 1885. With the rest of the Marshalls, Enewetak was captured by the Imperial Japanese Navy in 1914 during World War I and mandated to the Empire of Japan by the League of Nations in 1920. The Japanese administered the island under the South Pacific Mandate, but mostly left affairs in hands of traditional local leaders until the start of World War II. 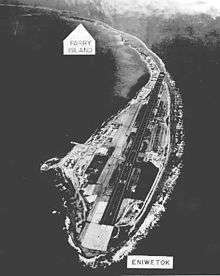 In November 1942, the Japanese built an airfield on Engebi Island; because they used it only for refueling planes between Truk and islands to the east, no flying personnel were stationed there and the island had only token defenses. When the Gilberts fell to the United States, the Imperial Japanese Army assigned the 1st Amphibious Brigade, a unit formed from the 3rd Independent Garrison unit previously stationed in Manchukuo, to defend the atoll. The 1st Amphibious arrived on January 4, 1944. Of the 3,940 men in the brigade, 2,586 were left to defend Eniwetok Atoll, supplemented by aviation personnel, civilian employees, and laborers, but were unable to finish fortifying the island before the American assault. During the Battle of Eniwetok in February 1944, the United States captured Enewetak in a five-day amphibious operation, with major combat on Engebi Islet, the most important Japanese installation on the atoll. 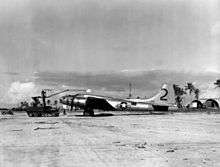 Combat also occurred on the main islet of Enewetak itself and on Parry Island, site of a Japanese seaplane base. Following its capture, the anchorage at Enewetak became a major forward base for the U.S. Navy. The daily average of ships present during the first half of July 1944 was 488; during the second half of July the daily average number of ships at Enewetak was 283. In 1950, John C. Woods, who executed the Nazi war criminals convicted at the Nuremberg Trials, was accidentally electrocuted here. Following the end of World War II, Enewetak came under the control of the United States as part of the Trust Territory of the Pacific Islands until the independence of the Marshall Islands in 1986. During its tenure, the United States evacuated the local residents many times, often involuntarily. The atoll was used for nuclear testing as part of the Pacific Proving Grounds. Before testing commenced, the U.S. exhumed the bodies of United States servicemen killed in the Battle of Enewetak and returned them to the United States to be re-buried by their families. Forty-three nuclear tests were fired at Enewetak from 1948 to 1958. 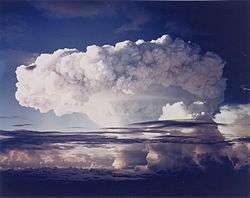 The first hydrogen bomb test, code-named Ivy Mike, occurred in late 1952 as part of Operation Ivy; it vaporized the islet of Elugelab. This test included B-17 Flying Fortress drones to fly through the radioactive cloud to test onboard samples. B-17 mother ships controlled the drones while flying within visual distance of them. In all 16 to 20 B-17s took part in this operation, of which half were controlling aircraft and half were drones. To examine the explosion clouds of the nuclear bombs in 1957/58 several rockets (mostly from rockoons) were launched. One USAF airman was lost at sea during the tests. Aerial view of the Runit Dome. The dome is placed in the crater created by the "Cactus" nuclear weapons test in 1958. A radiological survey of Enewetak was conducted in from 1972 to 1973. In 1977, the United States military began decontamination of Enewetak and other islands. During the three-year, $100 million cleanup process, the military mixed more than 111,000 cubic yards (85,000 m3) of contaminated soil and debris from the islands with Portland cement and buried it in an atomic blast crater on the northern end of the atoll's Runit Island. The material was placed in the 30-foot (9.1 m) deep, 350-foot (110 m) wide crater created by the May 5, 1958, "Cactus" nuclear weapons test. A dome composed of 358 concrete panels, each 18 inches (46 cm) thick, was constructed over the material. The final cost of the cleanup project was $239 million. The United States government declared the southern and western islands in the atoll safe for habitation in 1980, and residents of Enewetak returned that same year. 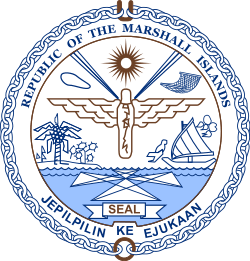 Section 177 of the 1983 Compact of Free Association between the governments of the United States and the Marshall Islands establishes a process for Marshallese to make a claim against the United States government as a result of damage and injury caused by nuclear testing. That same year, an agreement was signed to implement Section 177 which established a $150 million trust fund. The fund was intended to generate $18 million a year, which would be payable to claimants on an agreed-upon schedule. If the $18 million a year generated by the fund was not enough to cover claims, the principal of the fund could be used. A Marshall Islands Nuclear Claims Tribunal was established to adjudicate claims. In 2000, the tribunal made a compensation award to the people of Enewetak consisting of $107.8 million for environmental restoration; $244 million in damages to cover economic losses caused by loss of access and use of the atoll; and $34 million for hardship and suffering. In addition, as of the end of 2008, another $96.658 million in individual damage awards were made. Only $73.526 million of the individual claims award has been paid, however, and no new awards were made between the end of 2008 and May 2010. Due to stock market losses, payments rates that have outstripped fund income, and other issues, the fund was nearly exhausted as of May 2010 and unable to make any additional awards or payments. A lawsuit by Marshallese arguing that "changed circumstances" made Nuclear Claims Tribunal unable to make just compensation was dismissed by the Supreme Court of the United States in April 2010. The 2000 environmental restoration award included funds for additional cleanup of radioactivity on Enewetak. Rather than scrape the topsoil off, replace it with clean topsoil, and create another radioactive waste repository dome at some site on the atoll (a project estimated to cost $947 million), most areas still contaminated on Enewetak were treated with potassium. Soil that could not be effectively treated for human use was removed and used as fill for a causeway connecting the two main islands of the atoll (Enewetak and Parry). The cost of the potassium decontamination project was $103.3 million. It is projected that the majority of the atoll will be fit for human habitation by the year 2026–2027 after nuclear decay, de-contamination and environmental remediation efforts create sufficient dose reductions. Men from the 110th Naval Construction Battalion arrived on Eniwetok between 21 and 27 February 1944 and began clearing the island for construction of a bomber airfield. A 6,800-foot (2,100 m) by 400-foot (120 m) runway with taxiways and supporting facilities was built. The first plane landed on 11 March. By 5 April the first operational bombing mission was conducted. The base was later named for Lieutenant John H. Stickell. In mid-September 1944 operations at Wrigley Airfield on Engebi Island were transferred to Eniwetok. The airstrip is now abandoned and its surface partially covered by sand. The Imperial Japanese Navy had developed a seaplane base on Parry Island. Following its capture on 22 February, Seebees from the 110th Naval Construction Battalion expanded the base, building a coral-surfaced parking area and shops for minor aircraft and engine overhaul. A marine railway was installed on a Japanese pier and boat-repair shops were also erected. Test shot Nectar of Operation Castle produced a yield of 1.69 megatons and was detonated just north east of Ivy Mike's Elugelab crater. The Island of Bogon is the spearhead shaped object at the bottom right of the screen, as it was before the Redwing Seminole test was conducted on that island. ↑ A Pacific isle radioactive and forgotten, New York Times, Michael B. Gerrard, December 3, 2014. Retrieved 19 September 2016. ↑ Hacker, Barton C. (1994). Elements of controversy : the Atomic Energy Commission and radiation safety in nuclear weapons testing, 1947–1974. Berkeley, CA: University of California Press. p. 14. ISBN 0520083237. ↑ Clouard, Valerie; Bonneville, Alain (2005). "Ages of Seamounts, Islands and Plateaus on the Pacific Plate". In Foulger, Gillian R.; Natland, James H.; Presnall, Dean C.; et al. Plates, Plumes, and Paradigms. Boulder, Colo.: Geological Society of America. pp. 71–90 [p. 80]. ISBN 0813723884. ↑ Ludwig, K. R.; Halley, R. B.; Simmons, K. R.; Peterman, Z. E. (1988). "Strontium-Isotope Stratigraphy of Enewetak Atoll". Geology. 16 (2): 173–177 [p. 173–174]. doi:10.1130/0091-7613(1988)016<0173:SISOEA>2.3.CO;2. ↑ Schlanger, S. O.; Campbell, J. F.; Jackson, M. W. (1987). "Post-Eocene subsidence of the Marshall Islands Recorded By Drowned Atolls on Harrie and Sylvania Guyots". In Keating, B. H.; et al. Seamounts, Islands, and Atolls. Geophysical Monograph Series. 43. Washington, D.C.: American Geophysical Union. pp. 165–174 [p. 173]. ISBN 0875900682. ↑ Munk, Walter; Day, Deborah (2004). "Ivy-Mike". Oceanography. 17 (2): 97–105 [p. 98]. doi:10.5670/oceanog.2004.53. ↑ Hezel 1983, p. 3. ↑ Hezel 1983, p. 16-17. ↑ Carter, Worrall Reed. Beans, Bullets, and Black Oil: The Story of Fleet Logistics Afloat in the Pacific During World War II. Washington, D.C.: Department of the Navy, 1953, p. 163. ↑ Diehl, Sarah and Moltz, James Clay. Nuclear Weapons and Nonproliferation: A Reference Book. Santa Barbara, Calif.: ABC-CLIO, 2002, p. 208. ↑ Johnson, Giff. "Paradise Lost." Bulletin of the Atomic Scientists. December 1980, p. 27. 1 2 Schwartz, Stephen I. Atomic Audit: The Costs and Consequences of U.S. Nuclear Weapons Since 1940. Washington, D.C.: Brookings Institution Press, 1998, p. 380. ↑ Johnson, Bulletin of the Atomic Scientists, p. 24. 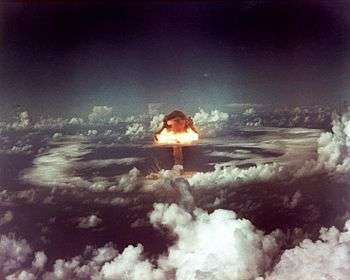 ↑ A 15 kiloton nuclear weapon exploded but did not undergo nuclear fission on Runit, scattering plutonium over the island. Runit Island is not habitable for the next 24,000 years, which is why it was chosen for the nuclear waste repository. See: Wargo, John. Green Intelligence: Creating Environments That Protect Human Health. New Haven, Conn.: Yale University Press, 2009, p. 15. ↑ The government said that the northern islands would not be safe for inhabitation until 2010. See: Johnson, Bulletin of the Atomic Scientists, p. 25. ↑ Linsley, Gordon. "Site Restoration and Cleanup of Contaminated Areas." In Current Trends in Radiation Protection: On the Occasion of the 11th International Congress of the International Radiation Protection Association, 23–28 May 2004, Madrid, Spain. Henri Métivier, Leopoldo Arranz, Eduardo Gallego, and Annie Sugier, eds. Les Ulis: EDP Sciences, 2004, p. 142. ↑ The Compact was ratified by both nations in 1986. ↑ Louka, Elli. Nuclear Weapons, Justice and the Law. Northampton, Mass. : Edward Elgar, 2011, p. 161-162. 1 2 3 4 5 Graham, Bill. "Written Testimony of Bill Graham, Public Advocate (retired), Marshall Islands Nuclear Claims Tribunal." Subcommittee on Asia, the Pacific, and the Global Environment. Committee on Foreign Affairs. United States House of Representatives. May 20, 2010. Accessed 2012-11-01. ↑ Richey, Warren. "Supreme Court: No Review of Award for US Nuclear Weapons Tests." Christian Science Monitor. April 5, 2010. ↑ Cesium, which is highly radioactive, is chemically similar to potassium. Since the atoll is deficient in potassium, plants absorb cesium from the ground instead. This makes the plants inedible. Cesium also is deposited in the muscles of the human body, just as potassium is. See: Firth, Stewart (1987). Nuclear Playground. Honolulu: University of Hawaii Press. p. 36. ISBN 0824811445. 1 2 "Loss-of-Damages From U.S. Nuclear Testing in the Marshall Islands: Technical Analysis of the Nuclear Claims Tribunal Methodology and Alternative Estimate" (PDF). 1 2 Bureau of Yards and Docks 1947, p. 325. ↑ Carey, Alan (1999). The Reluctant Raiders: The Story of United States Navy Bombing Squadron VB/VPB-109 During World War II. Schiffer Publishing. p. 64. ISBN 9780764307577. ↑ Morison, Samuel (1975). History of United States Naval Operations in World War II. Volume VI: Aleutians, Gilberts and Marshalls, June 1942-April 1944. U.S. Government Printing Office. p. 306. ↑ Bureau of Yards and Docks 1947, p. 326. ↑ Roberts 2000, p. 135. ↑ Roberts 2000, p. 186. ↑ Roberts 2000, p. 522-3. ↑ Roberts 2000, p. 623. ↑ Roberts 2000, p. 544. ↑ Roberts 2000, p. 35. 1 2 Roberts 2000, p. 410. ↑ Roberts 2000, pp. 233-4. ↑ Roberts 2000, p. 431. ↑ Roberts 2000, p. 267. ↑ Roberts 2000, p. 392. ↑ Roberts 2000, p. 591. ↑ Roberts 2000, p. 295. ↑ Roberts 2000, p. 236. Roberts, Michael D. (2000). Dictionary of American Naval Aviation Squadrons, Volume 2: The History of VP, VPB, VP(H) and VP(AM) Squadrons. Washington, D.C.: Naval Historical Center, Department of the Navy. Retrieved 2015-01-22. Bureau of Yards and Docks (1947). Building the Navy's Bases in World War II: History of the Bureau of Yards and Docks and the Civil Engineer Corps, 1940-1946. U.S. Government Printing Office. Hezel, Francis X. (1994). The First Taint of Civilization: A History of the Caroline and Marshall Islands in Pre-colonial Days, 1521-1885. University of Hawaii Press. ISBN 978-0-8248-1643-8. Wikimedia Commons has media related to Enewetak.